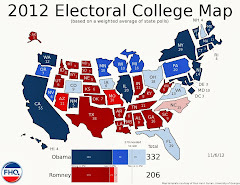 During the 2016 cycle, for the third time during the post-reform era, the Arkansas legislature again shifted up the date of its presidential primary, joining a group of mainly southern states in the SEC primary coalition. After some inter-chamber wrangling over how to accomplish the primary shift, legislation ultimately became law, but only temporarily. 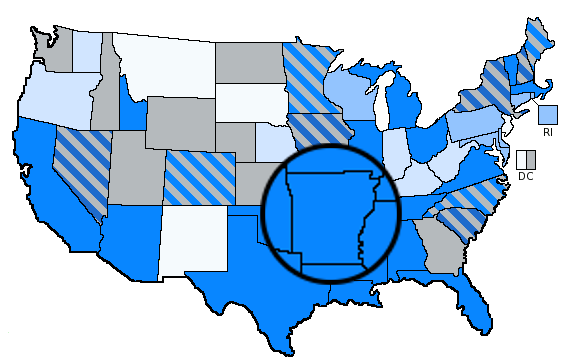 At the conclusion of the 2016 cycle, the new law met its sunset and the Arkansas primary reverted to its previous May date for subsequent cycles. That is, unless and until the legislature made the decision to make a permanent change. Some senators raised concerns about having to campaign and ask volunteers to campaign in winter weather and creating campaign seasons that would last all year. Some advocated deciding the primary date on an election-by-election basis. Additionally, Governor Asa Hutchinson (R) opposed the Senate bill, citing issues with the transition to four year terms for county elected officials. But Hutchinson also deferred to the legislature on the matter. None of that deterred members of the state House in February (2017) from launching their own effort thereafter to move the consolidated primary from May to March. HB 1697 was introduced and withdrawn due to technical issues with the bill.3 Later that bill was replaced with HB 1707 by the same author, Representative Michelle Gray (R-62nd, Melbourne), and the same robust list of co-sponsors. Initially, HB 1707 would have shifted up the general primary -- the runoff -- to the fourth Tuesday in March and the preferential primary three weeks before that on the first Tuesday in the month. But a concurrent piece of legislation -- one which later became law -- widening the gap between the two steps of the nominations process from three to four weeks working its way through the chamber forced an amendment to HB 1707. The amended language reconciled the House bill with the rejected Senate version by scheduling the general primary for the first Tuesday in April and the preferential primary for four weeks before that. That version overwhelmingly passed the House, 73-10, but like the Senate version before it, got bottled up in the Senate and died as the session came to a close. While this is yet another story of a 2017 bill with a 2020 primary date change failing, there are some notes to flag from the 2017 maneuvering in Arkansas for when the 2020 cycle transitions into its post-midterm period and the 2019 state legislative sessions. First, unless state Senator Stubblefield does not return to the general assembly in 2019, then there will likely be another attempt at moving the primary from May to March permanently. Second, there may be some changes to the make up of the Arkansas state legislature in the 2018 midterms, but the state Senate was where the permanent move of the presidential primary to March in the Natural state found resistance. And even then, the proposal only just barely failed to pass. The House passed its version. Finally, while Governor Hutchinson did not support the shift from May to March, he did defer to the legislature to make the decision. If the a bill to move the Arkansas primary can be shepherded through the state Senate, then the governor will not necessarily stand in the way. However, all of that is a story for 2019 (but with roots in the failures to make the change permanent in both 2015 and 2017). 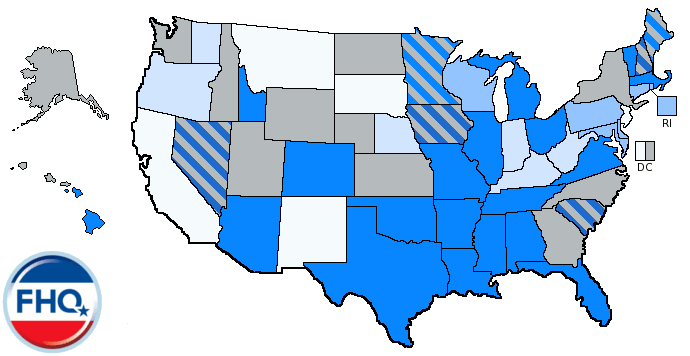 The Arkansas bills have been added to the FHQ 2020 presidential primary calendar. 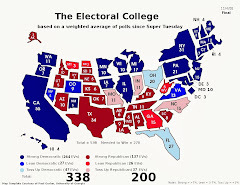 1 That would not be the case in every cycle, but due to the combination of the way that Arkansas codifies the scheduling of its primaries and the calendar in 2020, the Arkansas primary, under the provisions of this bill, would have fallen on the second Tuesday in March -- March 10, 2020. The way Arkansas sets this up is unique. 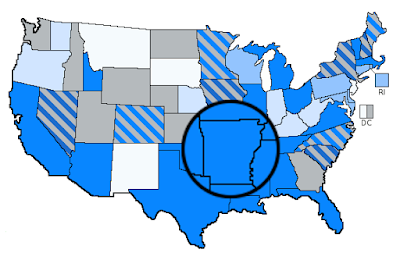 Although, the sequence does not apply to a presidential primary, there are two steps to the Arkansas nomination process for other offices in the context of a consolidated primary: a preferential primary and a general primary. This is not that different from a handful of other states, but the terminology is. A general primary in Arkansas is called a runoff elsewhere. And truth be told, that is the shorthand that is used in Arkansas, but not in the language of the statute. Said statute establishes the date of the general primary -- the second step in the sequence -- first. Currently, that is set for the third Tuesday in June. Based on that marker -- the date of the general primary -- the first step preferential primary is set for four weeks prior. 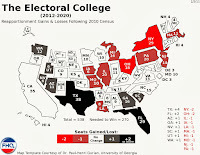 That would mean that the presidential preference vote would occur in late May concurrent with the preferential primary. And the intent of Stubblefield's bill was to keep that set up largely similar, but to shift it up on the calendar by more than two months. However, the goal was also to reestablish and make permanent the SEC primary position Arkansas had on the first Tuesday in March for the 2016 cycle. This bill fell short on that mark because there will be five Tuesday in March 2020. Setting the general primary for the first Tuesday in April and the preferential primary for four weeks before would establish a system where Arkansas would toggle back and forth between a position on the first Tuesday in March and the second Tuesday in March depending on how many Tuesdays there are in March in a given year. This could be reconciled if the preferential primary was the established baseline from which the general primary scheduling is based, rather than vice versa. But it is not. Again, Arkansas is unique. 2 This is distinct from rules in other legislative settings in and out of Arkansas requiring a majority of those voting. For a bill to pass the Arkansas state Senate, 18 is the number -- a majority of the full Senate membership whether every member is present and voting or not. That will remain so as long as the full membership is 35 in number. 3 The bills are identical to each other with the exception of a few places where current law was struck and new passages were added but not underlined (in the original) to denote what was being added or changed in the law by the bill. HB 1707 fixed those issues and became the vehicle for the attempted primary change.